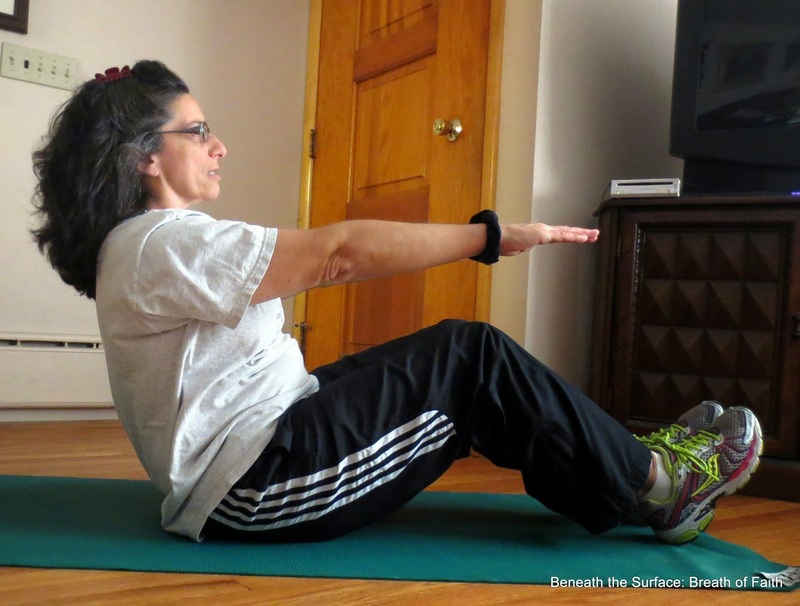 This post includes the seven basic moves for the 31 Day Fitting in Fitness Challenge. I tried to keep it simple. Take it slow, use control on your movements. Remember 6 excellent moves is better than 15 sloppily executed moves. Naturally, good form in movements is safer as well, so take your time feel for the move and you will get to k now what muscles are working. We will take a closer look at the moves and details on future posts as we go into the 31 Days of Fitness, in the meantime, here are some images to help you get the general picture! Remember to breathe. Listen to your body, and do what you can! My sweet Girl suggested I make a video, but we will have to see about that! For now, let’s take it slow! Hope these help you get started! 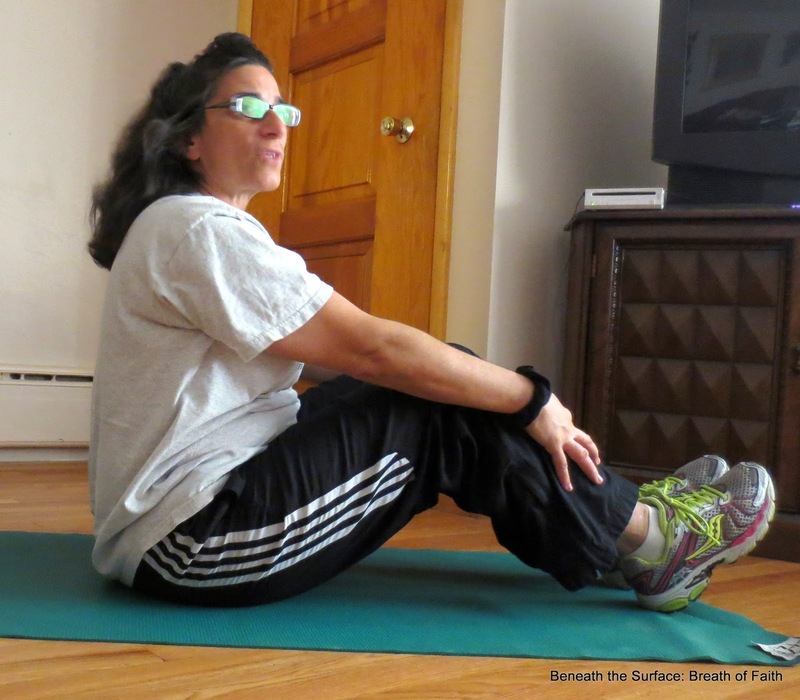 Option: The Sit Up as a Roll Down- Try to reverse the sit up and start at the sitting position, slowly sitting back. 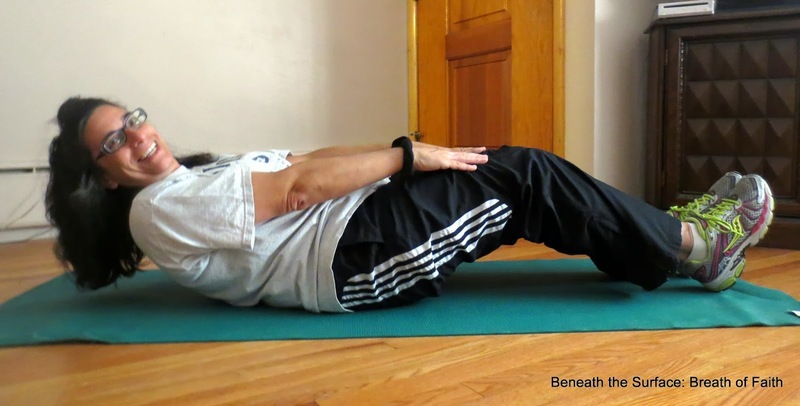 Only come back until you feel your abdominal muscles engage, then return to top. 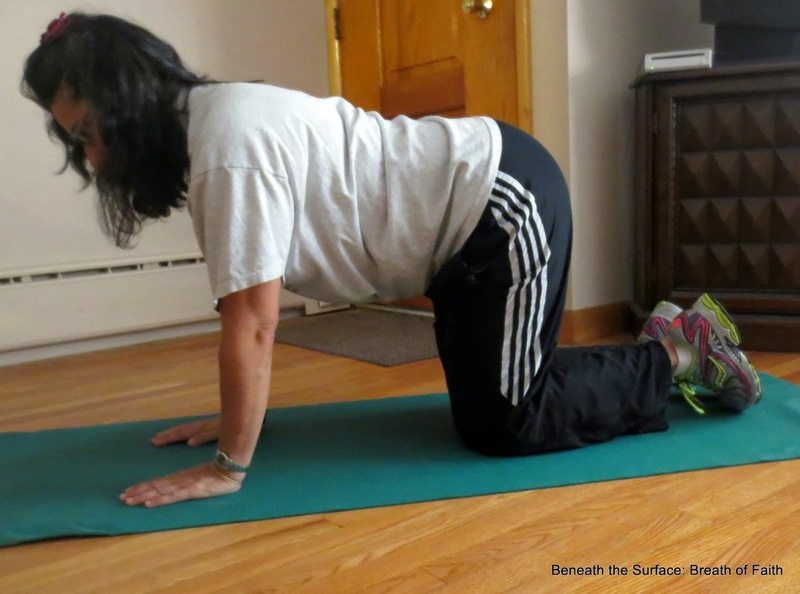 Option: Curl shoulders off floor, slide hands to knees, return. 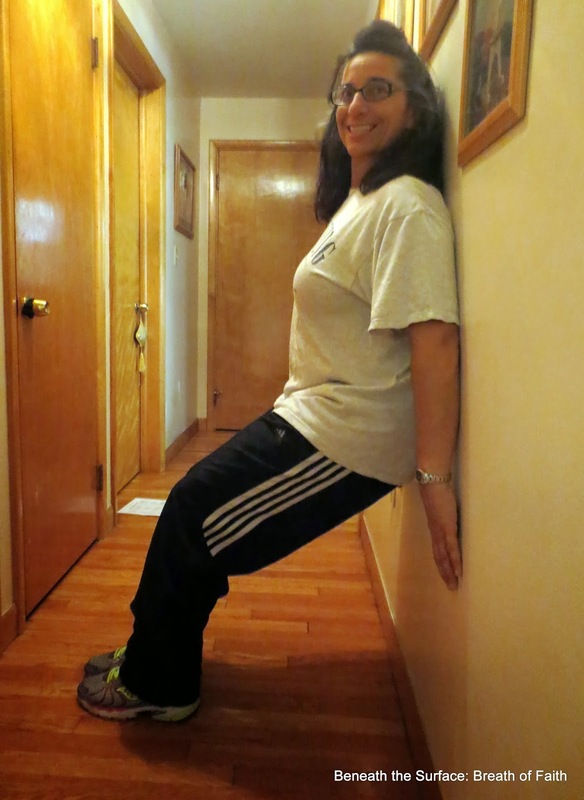 Wall Sit- modify by depth, feel thighs, do not break parallel. 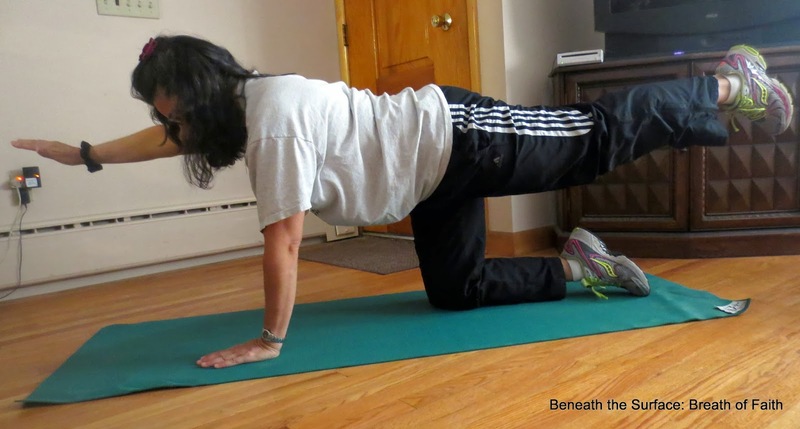 Activate midsection by pressing base of pelvis into wall and keeping hips even. I usually like to have thighs parallel to floor, but I modeled conservatively- you want to feel your thighs, not your knees. Lunge options! 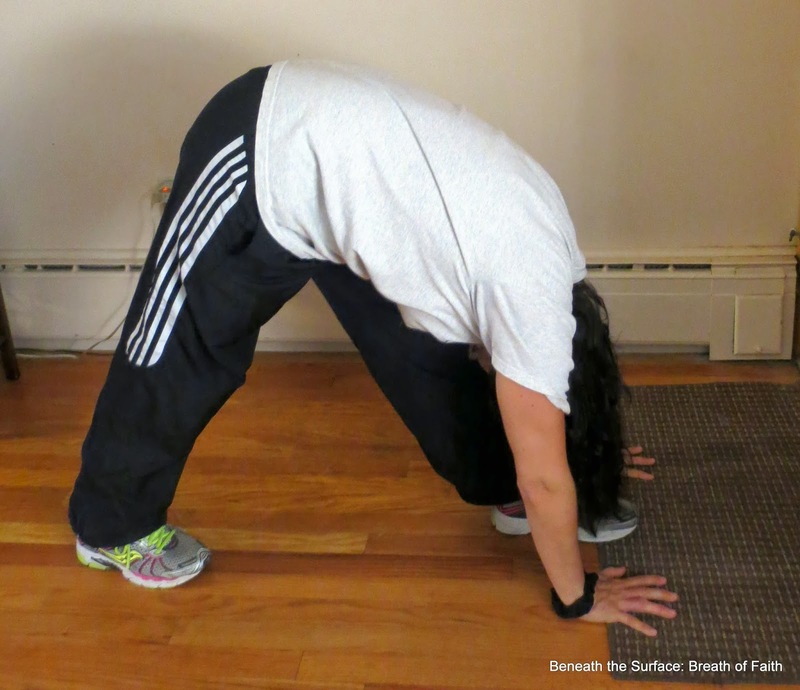 When performing the lunge, imagine the up and down motion of a carousel horse with your torso. 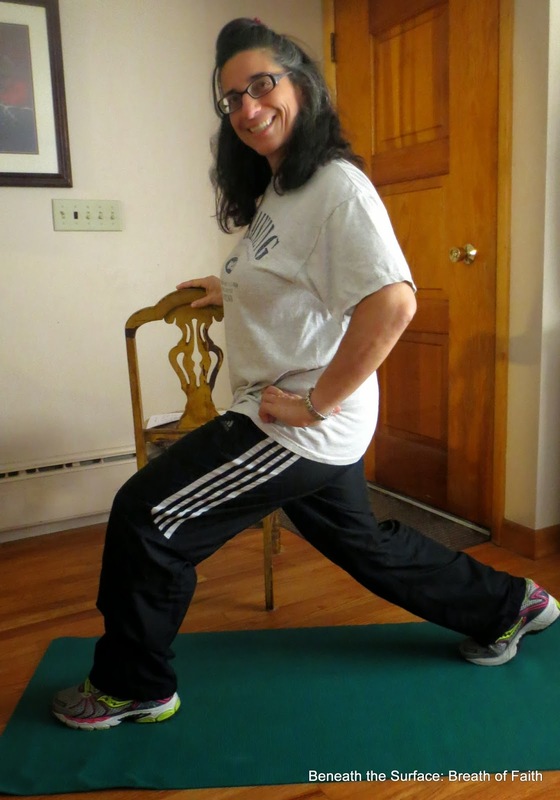 Lunge with Chair for Support. 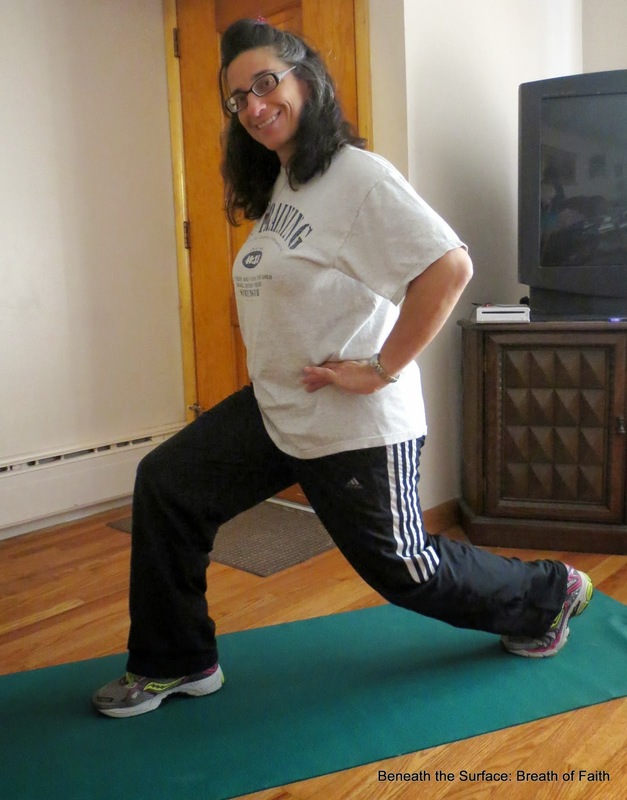 Basic Lunge- step forward, bending both knees, keeping hips even. land on front foot with weight even, push off front foot/leg to return to start, alternate legs. 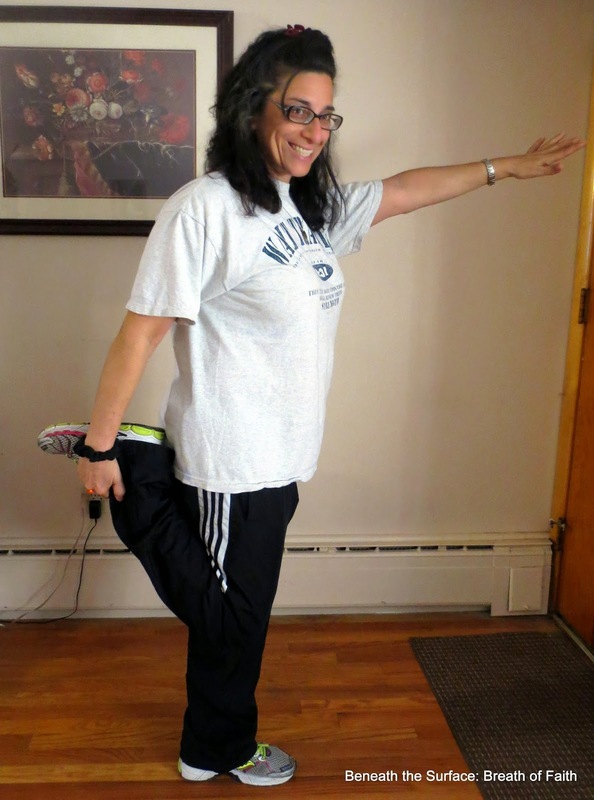 For Just the Stretches- click HERE! 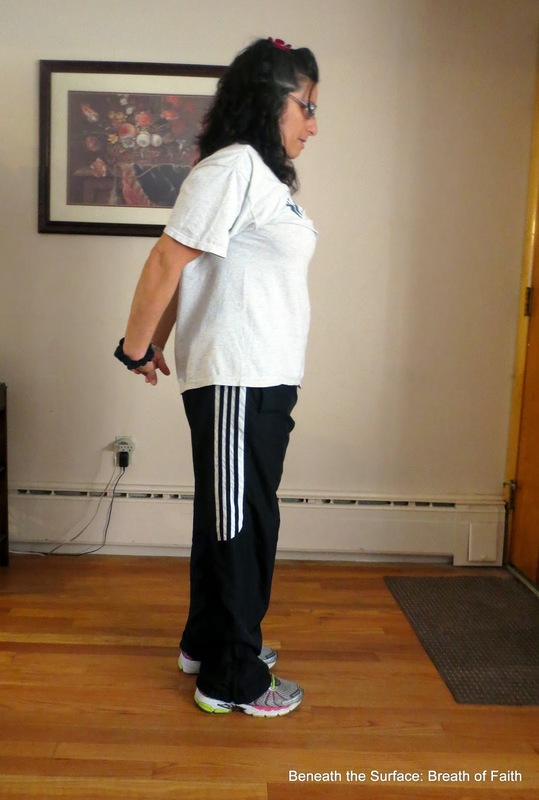 To make this easier, I thought I would post the stretches and exercises on their own stand apart posts. 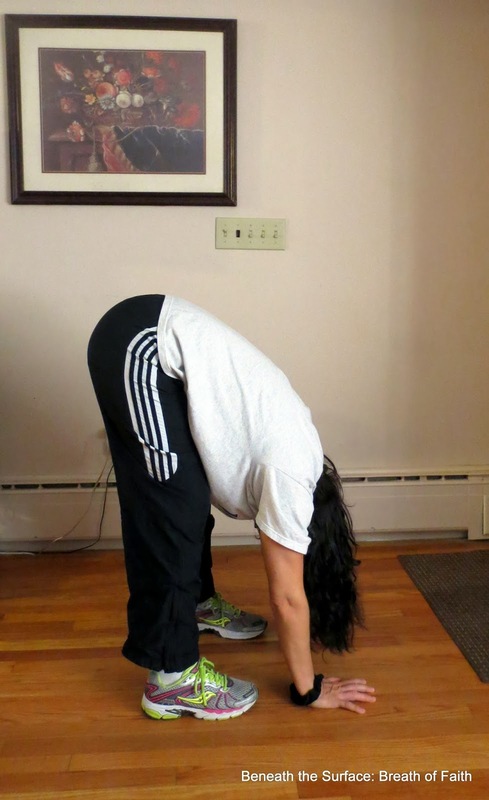 This is the handy dandy Anytime Stretch Routine. 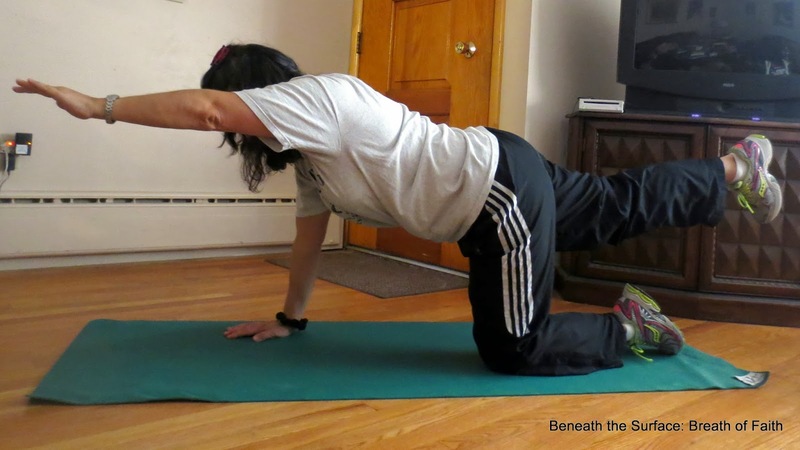 It is not all inclusive but just a sequence of stretches that I think flow well. 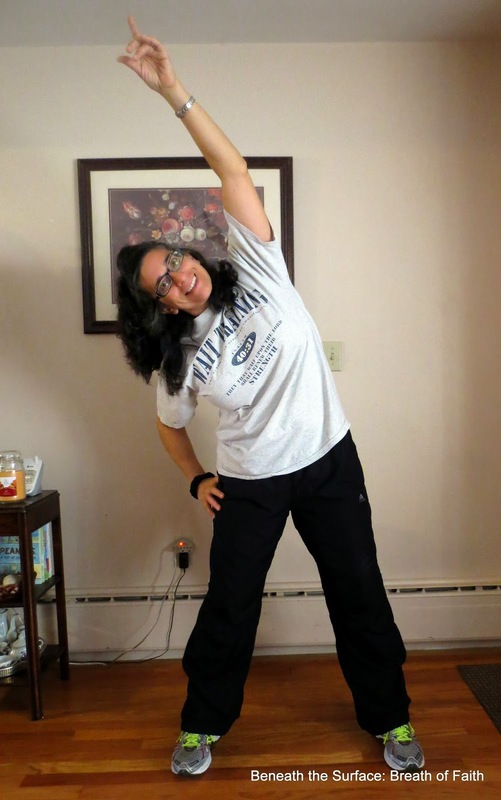 I will show you some great stretches, sources and links in the days ahead so stress not and stretch on! 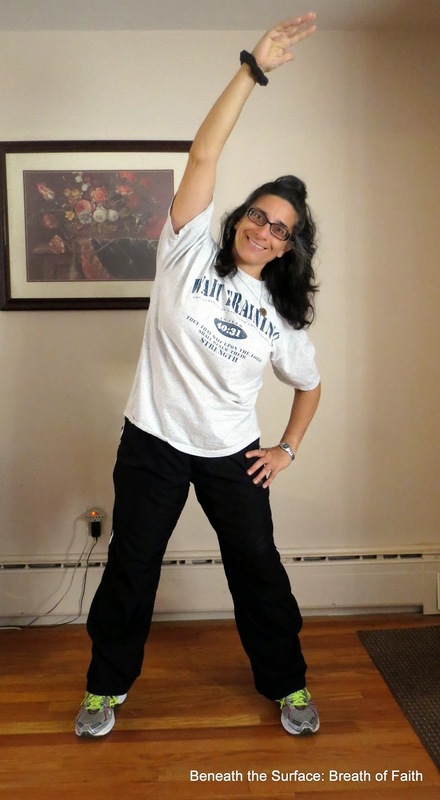 Oh, I need to add: generally it is beneficial to hold stretches for 30-60 seconds. I like to just go by how the muscles and stretch feel, as opposed to a time. So if my calf muscles feel tight I will spend however long it takes to relieve that tightness. This means an area that is less tight will get less attention sometimes, but not get totally neglected. You have some flexibility to determine what is right for you on any given day. Did you catch my cute little play on words. I know, I am so stinkin’ cute. Sigh. Cute now, object of hate later…I know it’s true. 1. 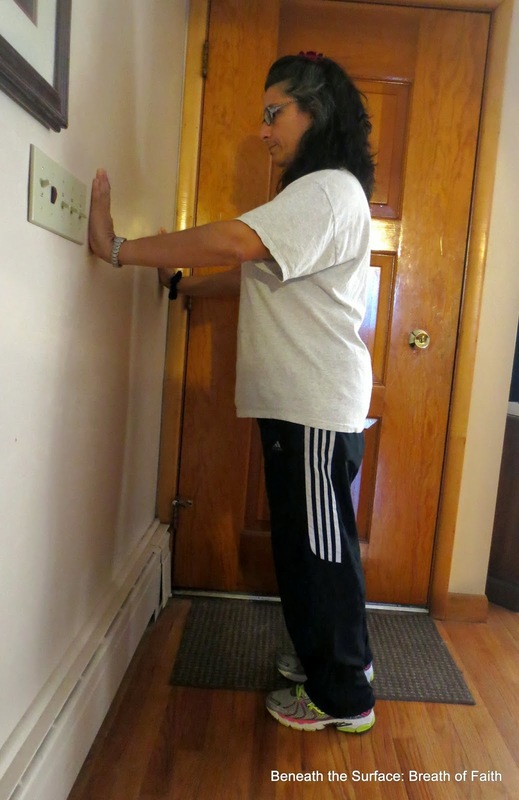 Standing Quadriceps: stretches front thigh-feel free to use wall or chair for balance. You can also catch foot/ankle with strap or belt if trouble reaching. 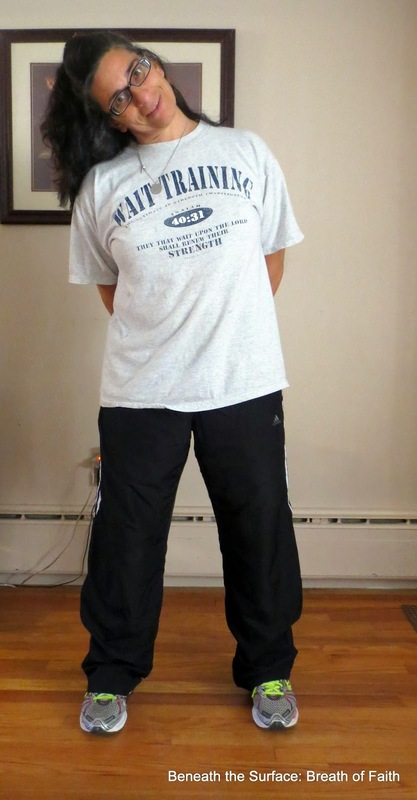 Try not to lean or lock standing leg. 2. 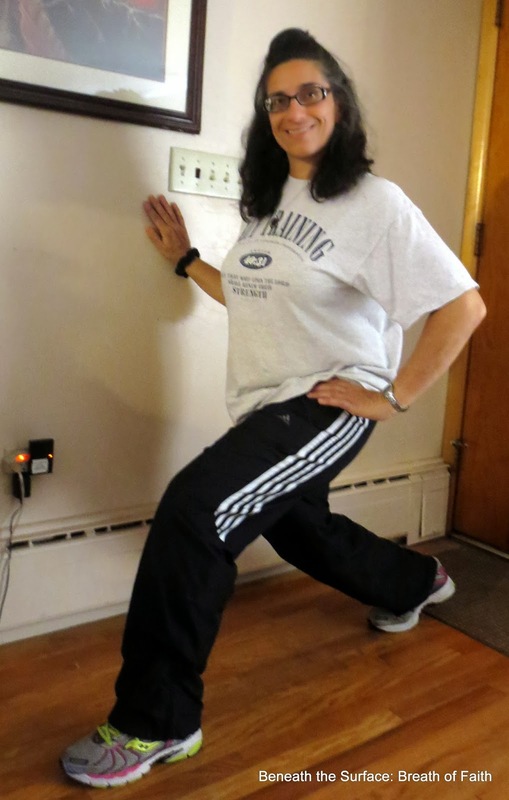 Standing Calf Stretch: Stretching back with same leg, plant heel on floor and lean slightly forward, keeping chest upright. 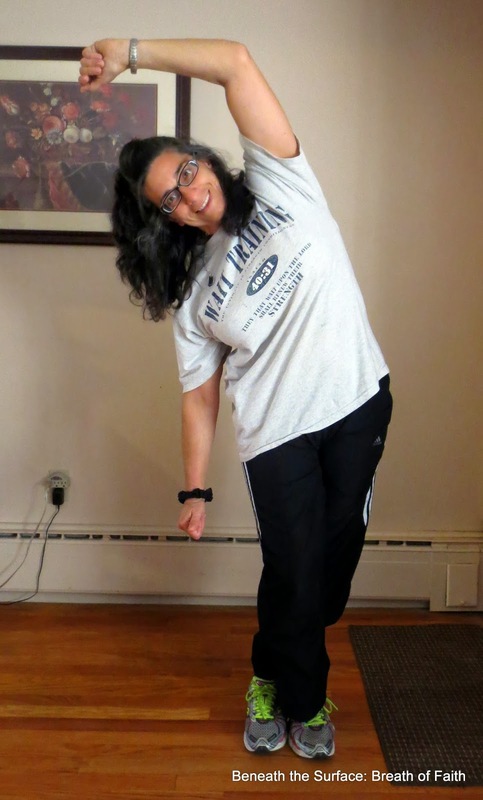 Think of gently pressing the heel into floor and leaning forward to feel stretch in lower leg. 3. 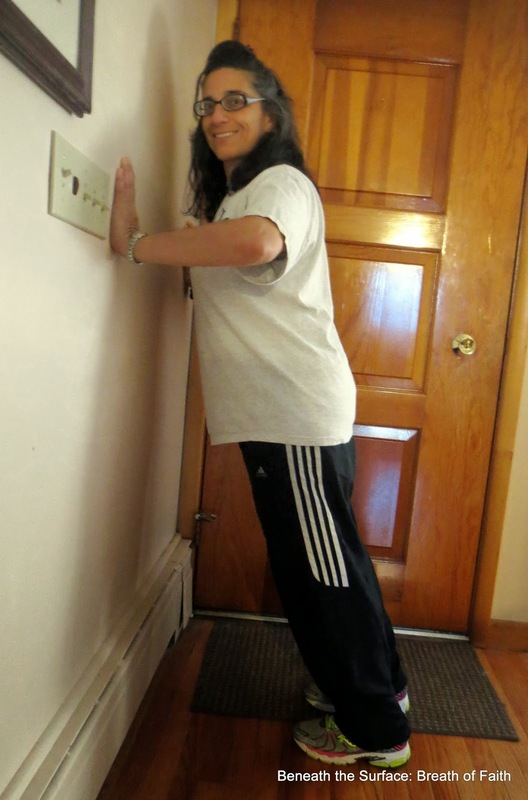 Modified Hamstring/Pyramid: Using wall for support bend forward from hips, keeping chest lifted, until you feel stretch in back of the front leg. a. If safe proceed to chest to knee forward bend. 4. 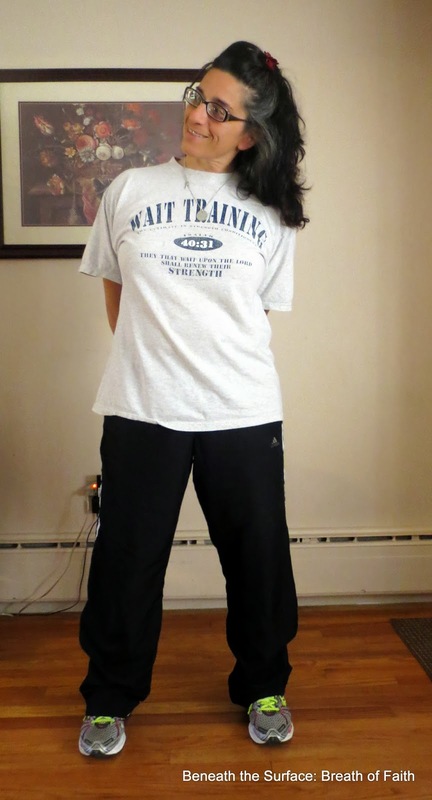 IT Stretch: This one is tricky and can be done a couple of ways-see what works- While standing cross left leg in front of right, bend to the left at waist- I like to use the wall sometimes, You should feel it at the hip and along side of leg. Reach to one side then the other. Nice and easy, right? 6. 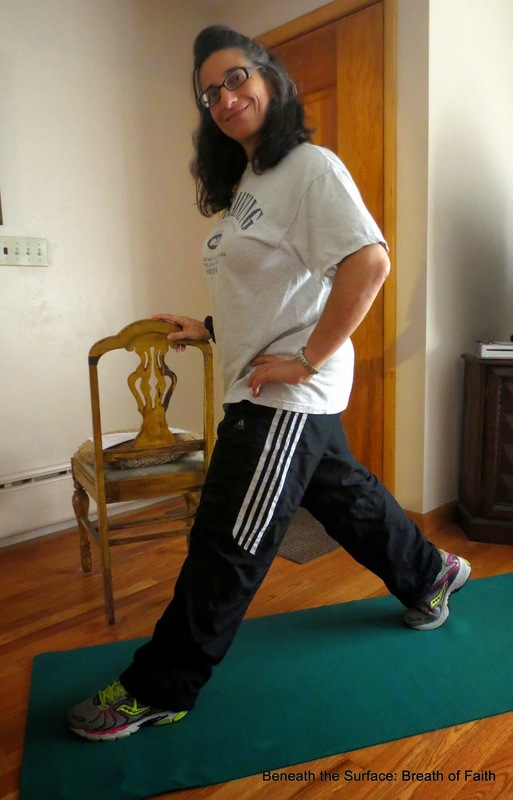 Forward Bend- You can modify this stretch by keeping knees bent – mine are actually softly bent here, also I have long arms, so don’t feel you need to touch floor. 7. 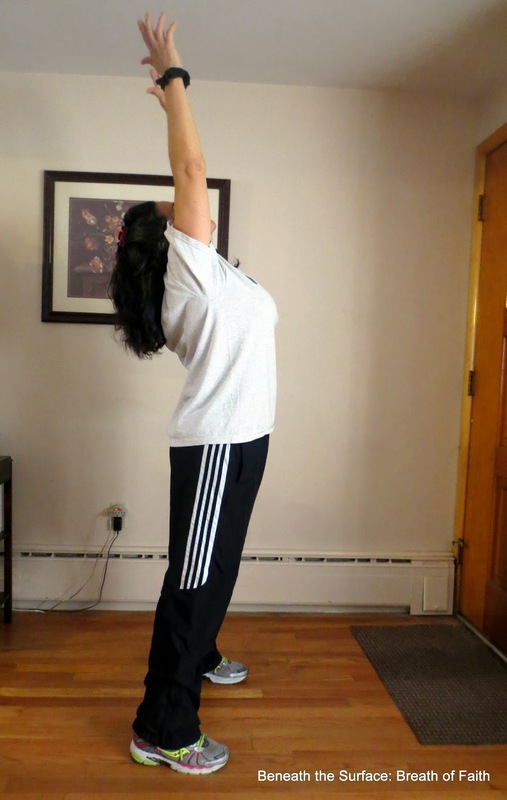 Overhead stretch- think of lifting chest to sky-as if a plane flew right over your head. 8. 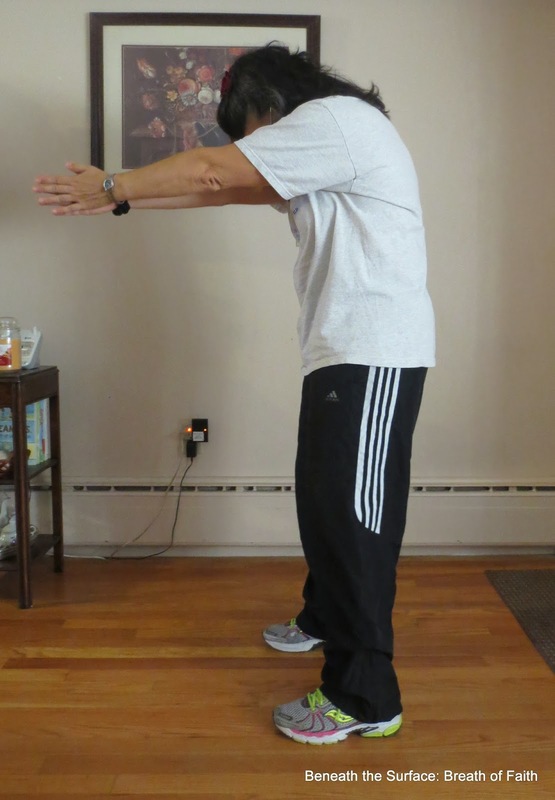 Executive Stretch: Support head with palms of hands, lift chest while opening upper body. a. 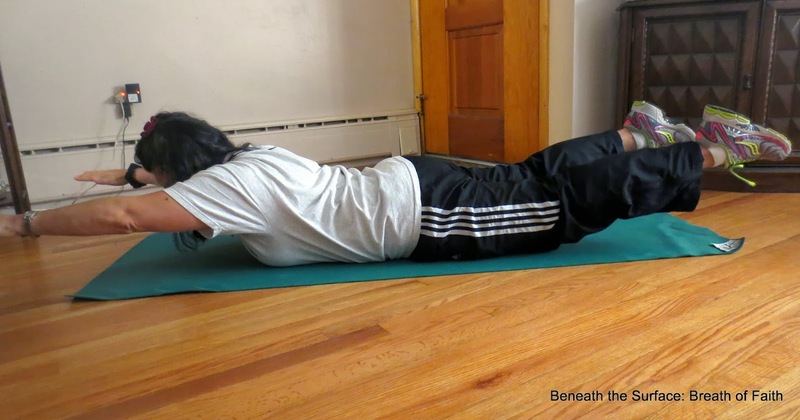 Upper Back: Palms together, press shoulders away and adjust to feel stretch in upper back. b. Pressing palms together we end in prayer! Just the Exercises are HERE! My sweet daughter “flicking” me from afar during our photo session. Sweet soon to be teen- love that kiddo! She takes credit for all the photos for our challenge! Well here we are at Week 1 for our challenge. I hope you have had a chance to peek at the details but each week I will post the breakdown for both tracks. Remember you can jump in anytime and you can modify as needed. The one thing I will say is write it all down. I have provided a tracking document but you can use your own method, planner, journal or calendar -whatever works. My plan for tomorrow (Monday) is to start the C25K program and do the test. But this means I will probably go into my challenge slightly compromised as I have not done much at all over the Summer. Actually let me rephrase that: my last workouts were more than three months ago…which means my muscles may not be thrilled with my little plan initially. However, since they are made for movement, ultimately they will be overjoyed. Joints over the age of 40 are generally skeptical of these efforts; I am sure we will be having a few words. If you are wondering whether you should do the test, I think I would say NOT if it will set you back at the onset. I just wanted the option available. 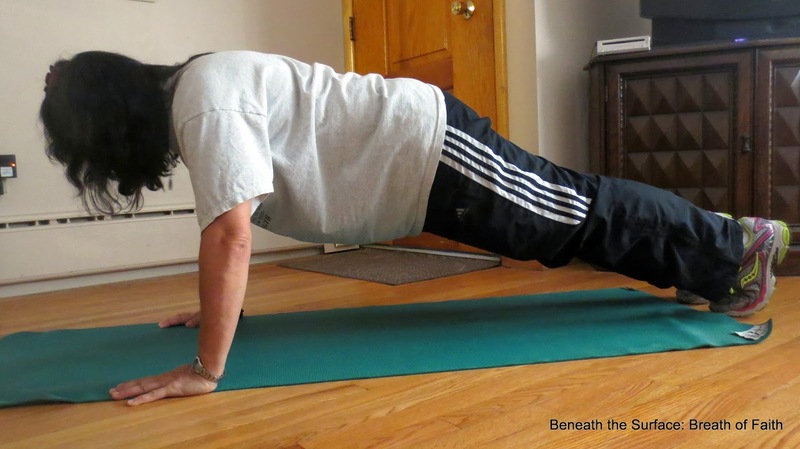 There are 7 total exercises and @10 stretches in the Challenge base. 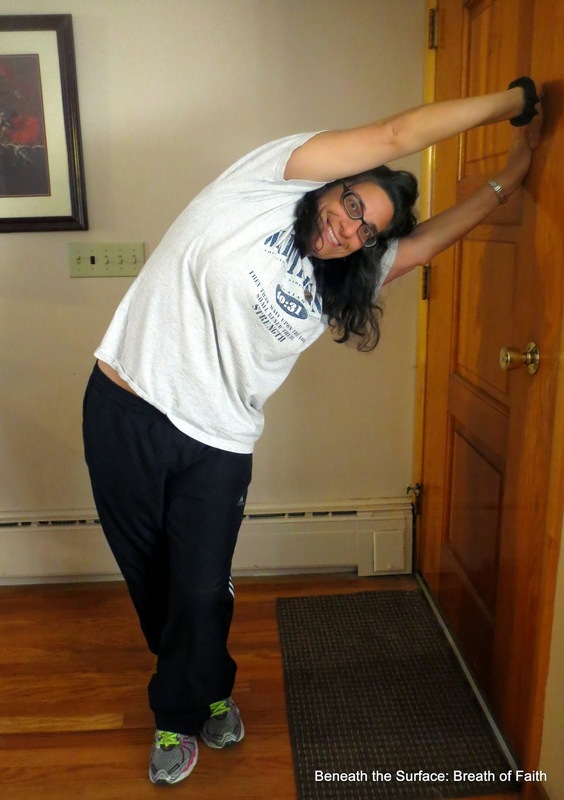 My girl did some photos of me modeling the stretches and exercises. They are not perfect, by any stretch of the imagination. I am sure when I am rich and famous, I will pay someone to make them go away. Meantime, pardon the greys, but you have me, more real than need be. BUT hopefully you will have a clue somewhat how the exercise should be performed. 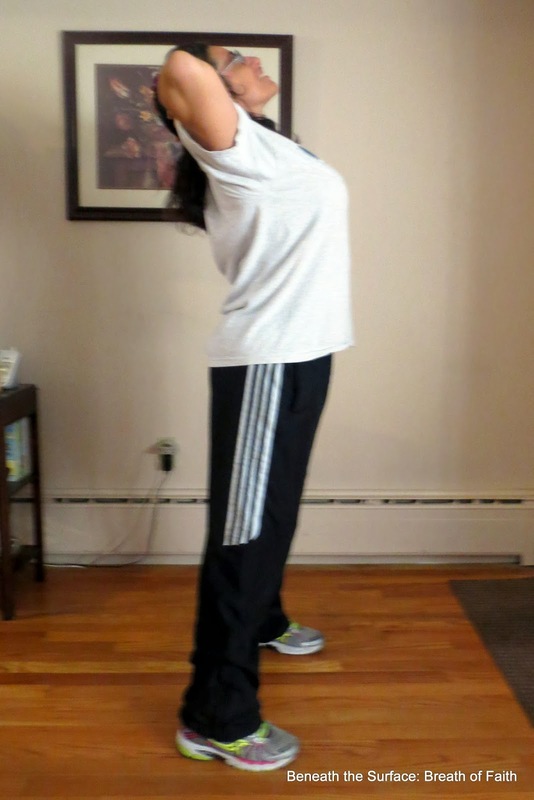 Exercises and Stretches pictures will be posted Monday, September 30th. I’m already exhausted from all this planning… phew! But you have no worries since you get to follow along, more or less! Please chime in and share which challenge you will be participating in for the next 31 Days. 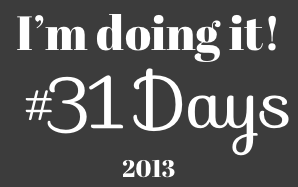 However you may have stumbled upon this 31 Day Challenge (hosted by The Nester), I want to you to make yourself at home here and also invite you to join me in my chosen journey for the next 31 days…Fitting in Fitness. I have been blogging primarily about the topics of Faith, Journal Writing and Life – or as I like to say Faith, Trust and Pixie Dust, for the past 2 1/2 years. To say my own fitness has been on the back burner would be an understatement, but here is the good news: You and I get to journey together as we try to fit fitness into our current daily lives. The fact is life happens while you’re busy making other plans, right? But, I have the plans all ready for you, you just fit it in, in a way that makes sense to you, track the process and record your progress! e. Journal 1- exercise tracker for c.
*please modify and adjust as needed. *I am not so tech savvy but the document is available on Scribd (scroll down- it is also embedded in this post). I am not completely happy with how it turned out and have been trying to modify it, but if you contact me via e-mail, I will be happy to send you a copy for easy printing. If anyone has any suggestions how to make this better, I am open to that. I will also continue to work on the Scribd site- which is neat, but all new to me, to improve the document. 3. I am posting all information a tad earlier this weekend so you have time to prepare print out and start fresh, mentally as well as physically.The testing at the beginning is optional, and I do not recommend it for everyone.If you have been sedentary, I would advise against it. Day 1 is not the day to go from stop to overdrive. 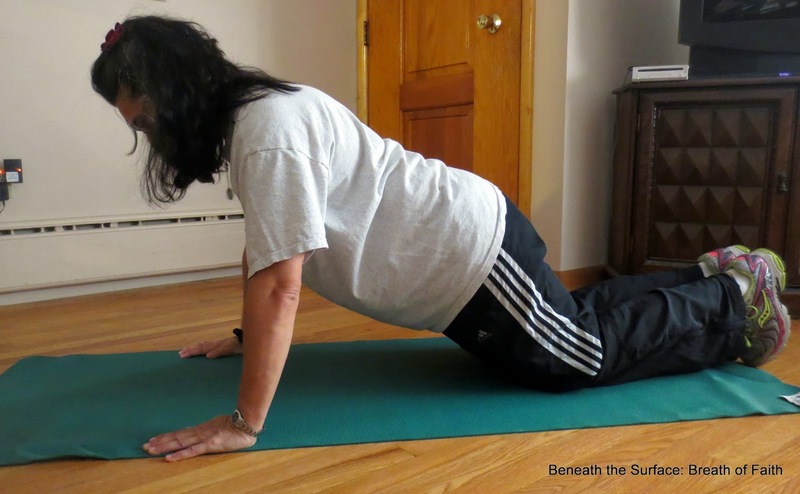 The goal is to be more active, not give ourselves another excuse to crawl back to the couch! 4. 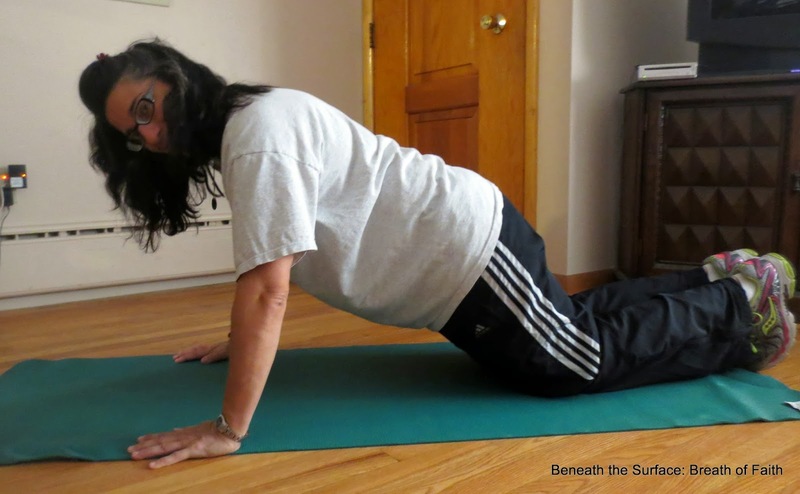 All Posts related to The 31 Days of Fitting in Fitness can be found at The Landing Page which will be conveniently located at the blog sidebar. 5. One thing I want to let you know is I am leading and participating in this journey as a blogger/participant, not a Personal Trainer-I am sharing my journey and pray it blesses you wherever you are. If participating in this 31 day challenge helps you incorporate activity into your life regularly then it will have been a successful endeavor. If it does not do this for you (although I will be praying it will!) then don’t give up- find what works for you! 6. Additionally I am utilizing the Couch to 5K program for the aerobic aspect of my fitness challenge. I have no desire to run competitively and have already run a 5K race many moons ago. 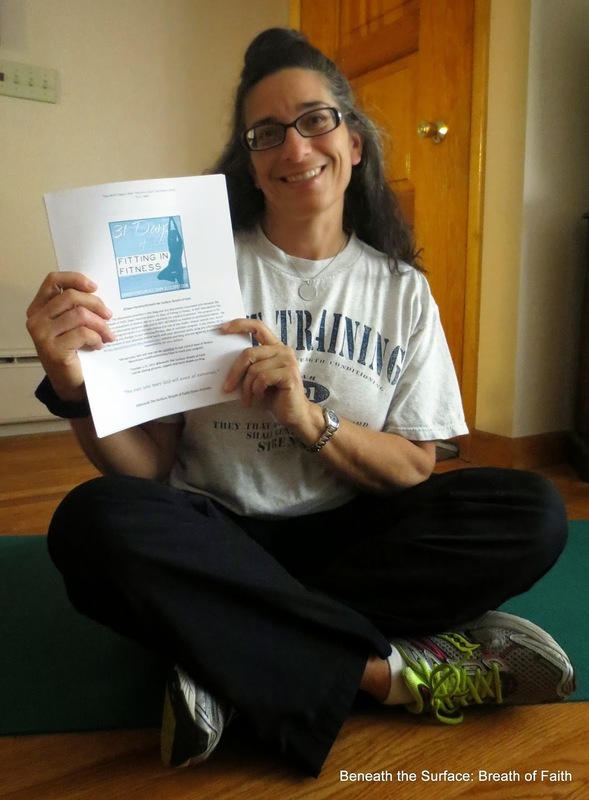 I like this program because it is a great beginning running program for almost anyone. Seriously, I have not run much since my hip injury and I may have to revert to walking. Like you, I will adjust as needed. 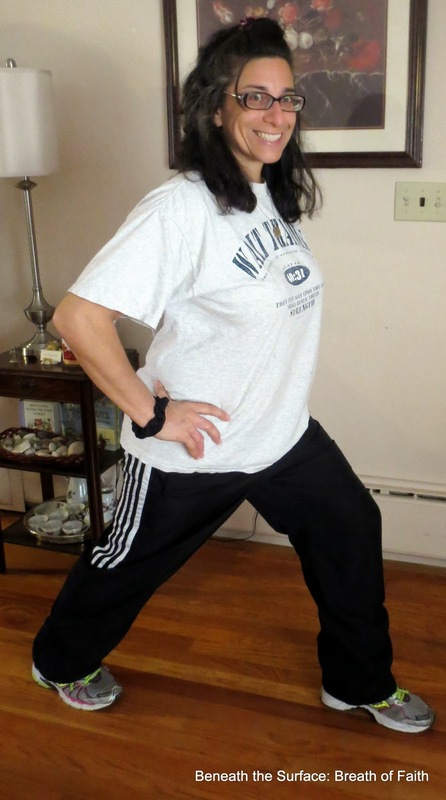 Those who choose the Be Gentle With Me Fitness option have a very doable walking program included in their 31 day challenge while The Core and More option does not (hence this addition). 7. This is not required but if you all want to check in on the Sunday post with a link/or comment in the comment section, to encourage one another, share victories, setbacks and how you are doing, I am open for that. BUT, I stress I don’t want this to be a burden: show up if you want or need, otherwise carry on! So welcome, dear friend, to 31 Days of Fitting in Fitness! This is long overdue, but just the right time- Amen? *E -mail me at dawn.paoletta@gmail.com if you would like me to send you a copy of the documents. 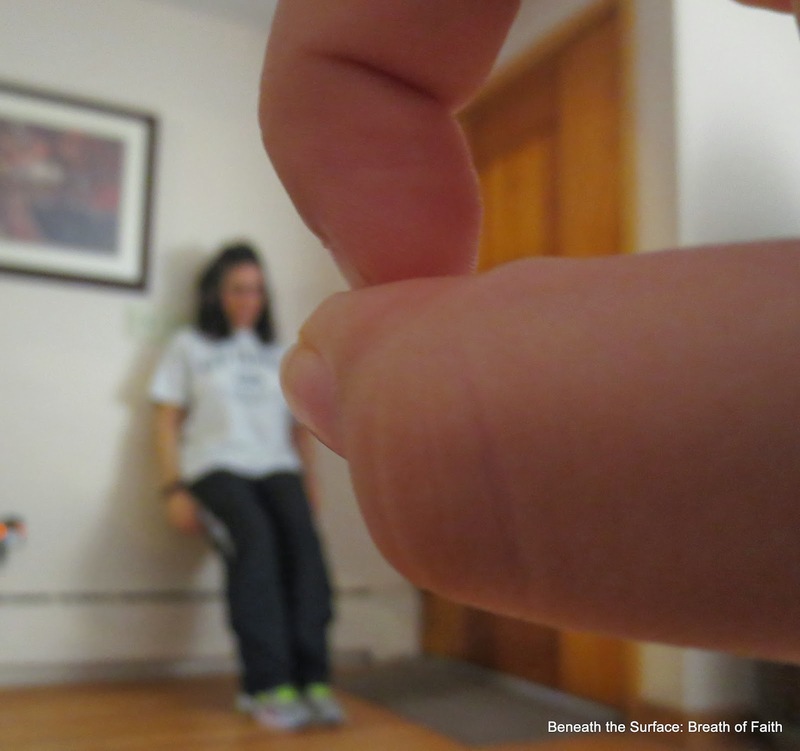 Disclaimer: The information provided in this blog and any documents associated with Beneath the Surface: Breath of Faith, Dawn Paoletta and/or 31 Days of Fitting in Fitness IS NOT intended for the treatment or prevention of disease, nor as a substitute for medical treatment. This program is for educational and informative purposes only and IS NOT INTENDED as medical or professional advice. Use of the fitness program herein is at the sole choice and risk of the reader. Always consult your doctor before making any changes to your exercise/fitness, diet or nutrition program. If you choose not to obtain the consent of your physician and/or work with your physician while using any information here in http://beneaththesurface-dawn.blogspot.com/ website and blog, you are agreeing to accept full responsibility for your actions. *Special thanks to Barbie for the beautiful blog button and prayers for health restored for her journey! 31 Days of Fitting in Fitness: Landing – This is where you can find all the posts for the 31 days of Fitness Series once they are published! Day 26 Fitness Together- Twice as Fun! Day 29 Take Ten for Better Health Today! 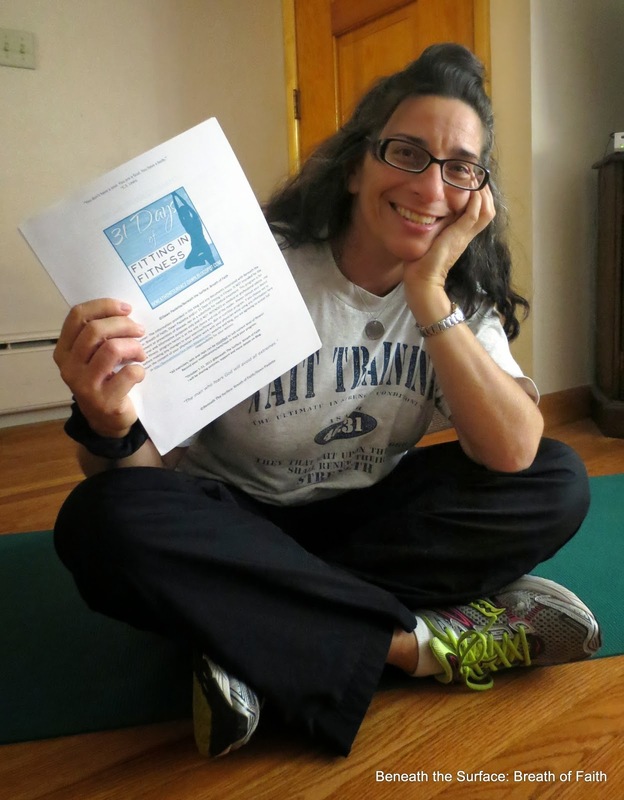 November 3rd Sunday Check – In: Join me on Sunday to share your journey, thoughts, comments or input about the 31 Day Challenge.